The following group types are not accepted by this hostel: Sports Group, Cultural Group If you have misrepresented the type of group you are booking for, your booking may be cancelled by the hostel." 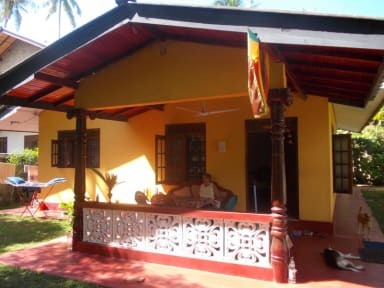 The house is situated in a quiet location just 5 minutes walk to the beach and 150 meters from the road where you can find small shops with necessary goods, cafes, as well as a bus stop. 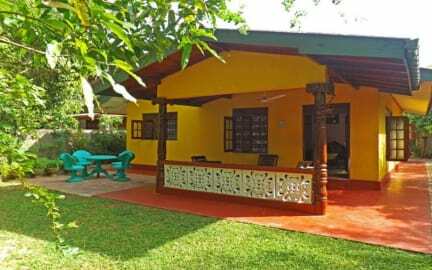 Ayesha Hostel is spacious, luxurious and immaculate house with two bedrooms, large living room, kitchen and an excellent outdoor living area. Each bedroom has an ensuite, hot showers, ceiling fans, wardrobe and mosquito nets. One room has two double beds which can be used as two big single beds or two small double beds, in the other one there is a large double bed. Cozy veranda overlooking a small garden with orchids and other flowers. The house has everything you need for living The kitchen includes a gas stove and refrigerator. Large living room. All rooms and the terrace have ceiling fans. Free Wi-Fi is available throughout the property. The owner Nimal and his family live next door, can cater to your needs and speak English. You can order breakfast (lunch / dinner). And also you can rent a tuk-tuk with driver for 1400 Rs/day, or a car with a driver 8500 Rs/day for independent tours around the island. (1) Check in/out any time. (2) Cancellation policy: 72 h before arrival. (3) Payment upon arrival by cash. We’ve had a whole house for ourself. Unfortunately the place was very difficult to find. It took us almost 45 minutes to get there. On maps.me the location was wrong, nobody around the area knew where it was and there were no signes.. luckely we found a man who knew the place and took us there. The people who live there are very kind and Made us a nice meal.